I have yet to try Kara’s Pimento cheese and the suspense is killing me! This past weekend, with twin sis in mind, I whipped up my own cheese spread for a late afternoon gathering on my apartment’s patch of green. Kara and I share an obsession with Feta cheese (the whole being Greek might be why), and find any reason to add it to a dish. I decided to think outside of the box and transform the savory, salty cheese into a sweet snack. I blended feta, whipped cream cheese, a touch of honey, lemon and cinnamon together. 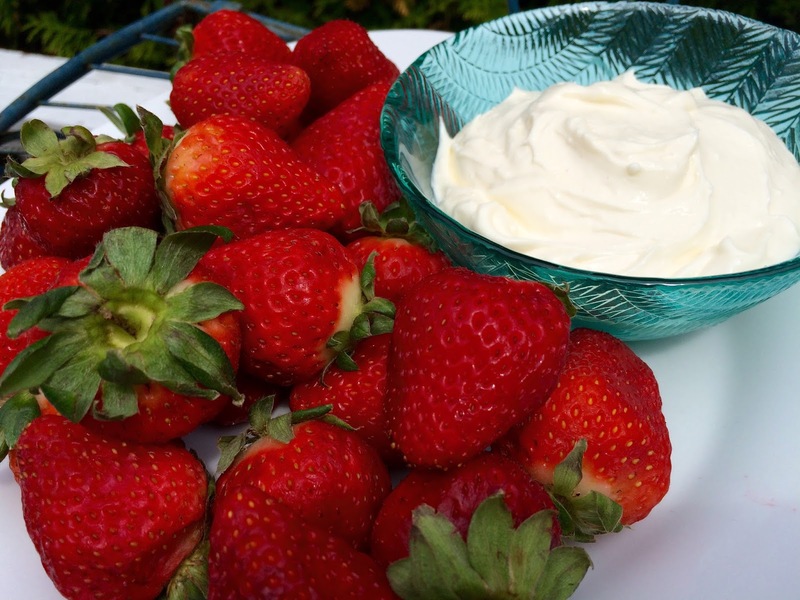 The resultant smooth and creamy spread added a pungent tang to spring’s first batch of strawberries. Paired alongside glasses of hot pink Rosé, this appetizer set the tone for balmy days ahead. Place the feta and cream cheese in a food processor and process for 20 seconds. Add the honey, lemon juice, cinnamon and salt and process for about 30 more seconds until the spread is combined and smooth. Pour spread into a bowl and serve with fresh strawberries for dipping. If you find yourself with leftover dip, I encourage you to slather it atop toast with with sliced apples and a drizzle of honey. A quick and intensely flavored breakfast treat!